Jacob Bogdani, also known as James Bogdany, Bogdane or Buckdan, was born around 1660 in Eperjes, Hungary, into a Protestant gentry family. He was educated in the Felsomagyarországi Evangélikusok Kollégiuma in Eperjes and most likely trained by his father, who was a painter himself. Probably caused by the recatholisation of his homeland, Bogdani immigrated via Vienna and Germany to Amsterdam in 1684, and finally settled in London in 1688. 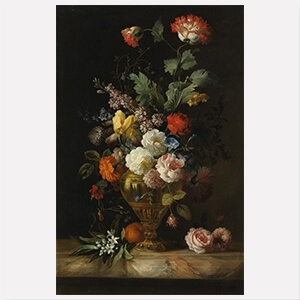 Within a few years, the talented young artist would be one of the most accomplished still-life painters in England, supplying the Queen`s private apartment at Hampton Court, the King`s palace at Dieren in Holland, as well as uncountable English country houses with his exquisite compositions of fruit and flowers. In 1693, Bogdani married the Englishwoman Elizabeth Hemmings and received English citizenship in 1700. By the beginning of the 18th century, he produced several paintings of birds for Admiral George Churchill (1653-1710), the younger brother of the Duke of Marlborough, who owned a large aviary. The artist’s luxurious ensembles of exotic birds, preferably parrots, with wild ones, found on the British isles, became hugely successful among the British aristocracy and perfectly matched the grand interiors of their palaces and stately homes. Bogdani became the outstanding advocate of this genre of his time, and was able to amass a sizable fortune. He purchased properties in Finchley, Spalding and Hitchin, where he became Lord of the Manor. Bogdani who was himself strongly influenced by Dutch and Flemish masters, had many followers and pupils, among them his own son, William (1699-1771), and his son-in-law, Tobias Stranover (1684-1756), who was also of Hungarian descent. Jacob Bogdani died in Finchley, near London, in 1724.